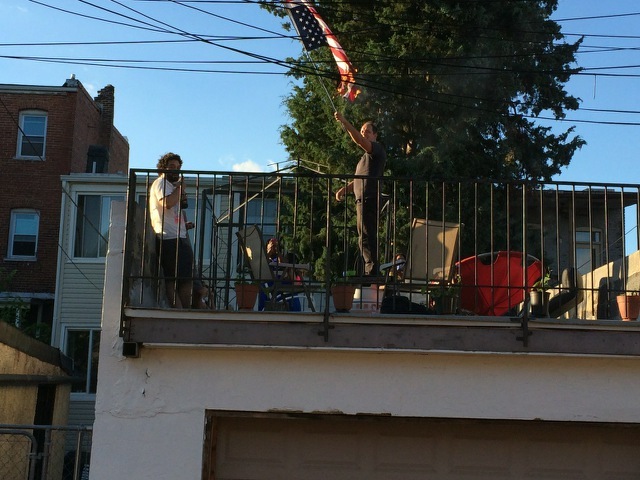 A bunch of hipsters decided it was really cool to burn the American flag on the 4th of July. It was around 7ish and the alley between Fairmont and Girard was in full party mode with loud music and BBQ. Then about 10 to 15 individuals, a mixed group with black and white in their late 20’s early 30’s came out on the deck over the garage with a flag upside down and then set it on fire. The property is a rental with constant change and the owner lives in New York. The flag took a long time time to catch on fire and eventually caught the attention of the many parties going on in the alley. Many people started yelling at the flag burners. The flag burners then started shouting about US imperialism and suppression of the blacks. Somewhere in the yelling there was also comments from them about how bad Obama was. Eventually, the flag caught on fire and started blowing chunks of flames very close to the cable and electric wires. At this point I called 911. Eventually 911 sent police over and at which point the flag burners went inside except for about two of them who then denied setting the flag on fire. Most of the neighbors came out and a rather heated argument ensured. I am not sure what occurred after but the flag burners went inside.